Cobblers boss Chris Wilder has jumped to the defence of under-pressure Luton Town counterpart John Still. The Hatters boss has been receiving criticism from a section of the Luton support after a poor start to the season. Luton just missed out on the play-offs last season, just 12 months after their promotion from the Conference, but after a summer of rebuilding they currently sit down in 14th. They are 14 points behind third-placed Cobblers who currently occupy the final automatic promotion spot, but they are only six points adrift of the play-offs. Wilder, who takes the Cobblers to Kenilworth Road on Saturday, says he doesn’t understand the criticism of the former Dagenham & Redbridge boss, and said: “I know John Still really well. “I have been and managed at that level, and the job that he did in getting Luton promoted was incredible, and this time last year I think they won eight or nine games on the bounce and were in the automatic promotion places. “They didn’t have a great end, but they are establishing themselves back into the Football League after countless years out. Wilder will be doing his utmost to ensure Still suffers another home defeat at the weekend, but even if that happens he says Still shouldn’t be under any pressure. Asked if the criticism of him from fans is unfair, Wilder said: “Absolutely, 100 per cent. The job he has done there in turning that club around is great. “I am sure that if John hadn’t taken that job they would still be in the same situation they were. “People, supporters and boards sometimes want instant success, and John brought that, but it can’t happen all the time. 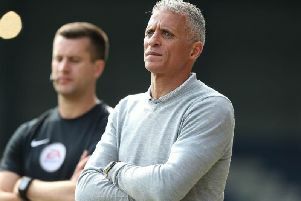 “Getting out of the Conference and getting into the Football League, it is tough. “There are a lot of big clubs in league two, that want to get out of the division, and for me Luton have the perfect man in place. “Sometimes things go against you with injury and suspension, and there are maybe a few signings that have not hit the ground running, but there is still plenty of time. “People should assess at the end of the season how things are going, and not make silly judgements in early December as there are 26 games to go.